Cows that produce human breast milk, fish that glow in the dark, and sheep that shed their wool without being sheared: in the Anthropocene humans have learned to modify animals and plants for their own benefit. By doing so, humans affect not only nature on its surface, they also alter the DNA, the building blocks of living organisms. Since the discovery of the double helix and the decoding of genetic sequences, it has become possible to insert foreign DNA sequences into the cells of completely different organisms. Selective breeding has also changed the flora and fauna around us. The human-caused process of evolutionary assimilation is exemplified by “man’s best friend”: the dog. Domestic dogs have changed substantially since humans started breeding them 15,000 years ago. Originally selected for their traits as hunting companions or as watchdogs, today dogs are pets and an expression of individual identity. They might be bred to fit in people’s handbags, as for example chihuahuas or miniature pinschers. Corn is another example of the extent of human modification of nature. No one could have foreseen the worldwide success of corn when indigenous peoples in Central America began to cultivate its ancestor, the wild grass teosinte, 10,000 years ago. Nowadays corn is not only used for food, it is also a component of disposable dishes, packing material, and t-shirts, and it is also used for fuel. Corn makes up a quarter of grain crops worldwide and is grown in large monocultures. Hybrid corn produces especially large harvests. However, hybrid and transgenic corn have one big disadvantage compared to traditionally bred corn: they do not propagate well and farmers have to buy seeds for planting every year, which causes ecological and societal problems. Created by Mari Tefre/Svalbard Globale frøhvelv. View source. Humans are dependent on agricultural crops. But crops that are grown in monocultures are susceptible to diseases, pests, heat, and drought. 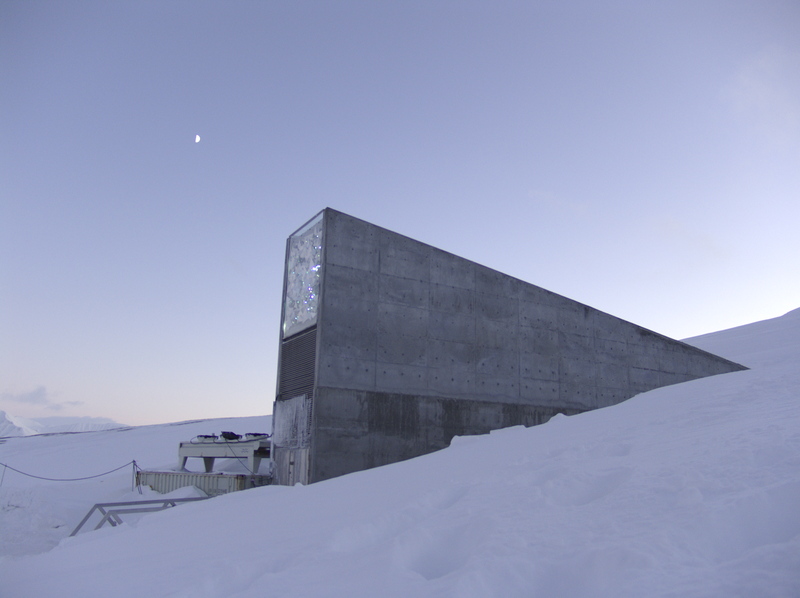 In 2009 the Svalbard Global Seed Vault was created. It is a well-protected underground seed bank in Svalbard in Norway and contains all local varieties of known agricultural crops. In a cold, earthquake-proof zone at -19 degrees Celsius, 750,000 seed specimens are stored deep in solid rock. Steel airlocks keep the sealed seeds safe for decades. It will stay frozen in the permafrost even if the electricity fails. Preserving the knowledge of the world’s farmers is at least as important. For many generations, farmers have grown the plants currently in use and have cultivated their seeds. Their local knowledge is one of the most valuable and most endangered resources of our time. Humans nowadays are changing the mechanisms of evolution in other ways as well: not through direct breeding, but by changing the environmental conditions in which species live. For example, codfish from heavily fished populations mature more quickly than specimens from unfished populations, because this increases their chances of reproducing before they are harvested. Because man-made changes to nature happen quickly and destroy natural habitats, many living organisms are threatened by extinction. Evolutionary assimilation requires generations, and many species cannot adapt quickly enough. Created by le Liz. View source. The oceans are particularly threatened by human activity. Worldwide, the coral reefs, a beloved attraction for divers because of their bright colors and their varied forms, are endangered. Coral reefs are a very sensitive ecosystem and are important birthing grounds for a wide variety of species. But fishing, pollution, and acidification of the ocean—the result of increasing amounts of carbon dioxide dissolved in the water—have destroyed the reefs; protected conservation areas may be the only remaining natural refuges where corals can survive. 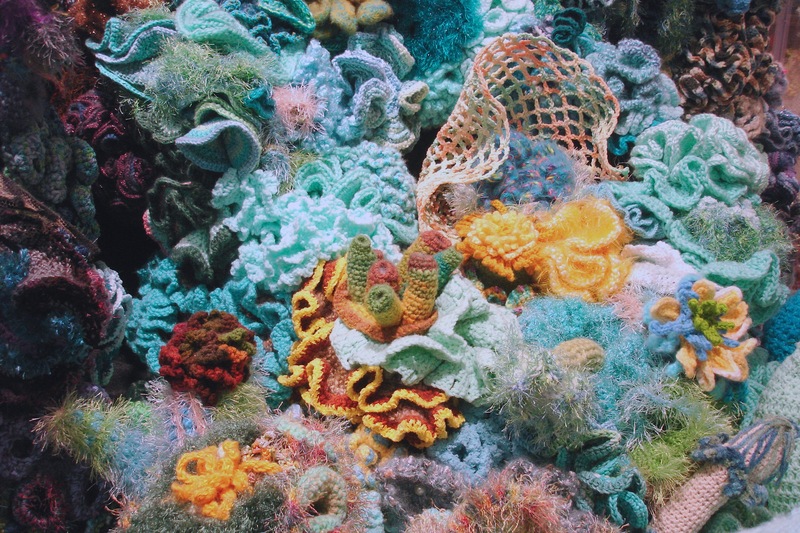 To remind people of the ecological threat to reefs worldwide, a 30m² reef made of crocheted “corals” was created at the Museum Kunst der Westküste. This ecological memorial, which you can see in the exhibition of the Deutsches Museum, brings together mathematics, science, handicraft, and environmental protection in a collective project. Genetic engineering and hybrid corn, seed banks and coral extinction, chihuahuas and oversized salmon—these are examples of man-made variety. We must ask ourselves the question: as the dominant force shaping the Earth’s environment, how will we deal with the responsibility that comes with our actions? What are the limits to our biological creativity?